Yay it's the weekend! As soon as I heard Claire's had mood polish it was on my "have to have it" list. I only picked up the calm/wild (purple/pink) bottle .I wanted all my tips to be long enough to showcase the alternate color. There were a few bald spots but nothing three thick coats couldn't handle. I saw the tips changing right away and noticed the silver flecks all throughout the polish. 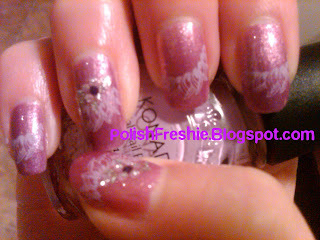 I liked the polish alone but wanted to play with konad and some purple nail art stickers I bought from Walgreen's. 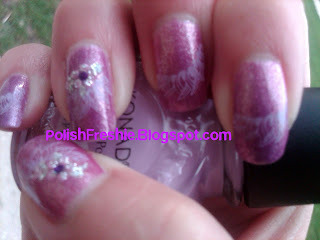 I used the Pastel Violet konad polish with plate m63. Then I bedazzled with Broadway Nails Fashion Diva stickers on my index fingers and thumbs. First shot is indoors with a flash second is outdoors with indirect sunlight. I think it looks very elegant! Do you like mood polishes? Which one is your favorite? Calm/wild is my favorite mood polish! I love your konad btw it's prettyy! very nice! I'm not into the mood polishes or myself, my nails are too short! wow, what a cool design!!! I've never tried mood polishes - they look so cool!! Jeanelle - I love the color combo of pink and purple, thanks! Zara - I know there's more brands and I want to check them out! This looks so cute with Konad! I have this in my untrieds. I'm waiting (impatiently!) for my nails to grow out enough to show off the color change. awesome :) I have 2 bottles of this but still haven't tried it! Kitty - I thought it was worth the wait! Of all the mood polishes from Claire's: calm/wild would be my favorite. For me there is such a sharp contrast between my free tip and nail plate...so I don't get much of a gradient look that some ladies have.